Vermont State Quarters are the 14th variety in a series of fifty design changes over a ten year period from 1999 to 2008. This Quarter was released into circulation on August 6, 2001. The reverse of the coin shows an individual harvesting sap from sugar maple trees in order to make maple syrup. Two things Vermont is well known for are Maple Syrup and skiing. The quarter also shows Camel's Hump Mountain in the background. 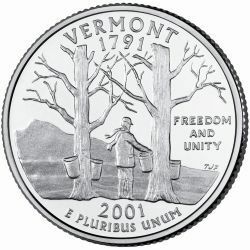 The reverse of the coin bears the inscriptions "VERMONT 1791", "FREEDOM AND UNITY", and "E PLURIBUS UNUM" along with the date of 2001.